Vid Guerrerio’s multicultural adaptation of Mozart’s Le Nozze di Figaro sets the action in modern-day Beverly Hills. Hollywood elite Paul and Roxanne Conti (Count Almaviva and Rosina) have been married for five years, and Figaro and Susana are undocumented workers on their estate. 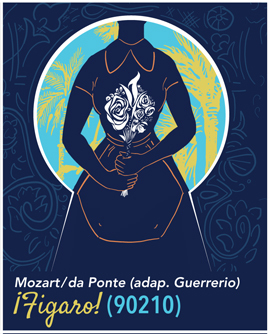 Hailed by Opera News as “dynamic, thought-provoking, respectful, and, yes, hilarious,” Guerrerio’s English and Spanish libretto infuses Mozart’s masterpiece with humor, heart, and present-day discussions of race, class, and American identity.